The Hadassah Medical Organization is Israel's biggest medical centre for healing, teaching, and research. It not only treats all patients equally within Israel, but also carries out humanitarian aid missions around the world, and trains doctors from over 90 different countries. Yet its work is relatively unknown in the UK. 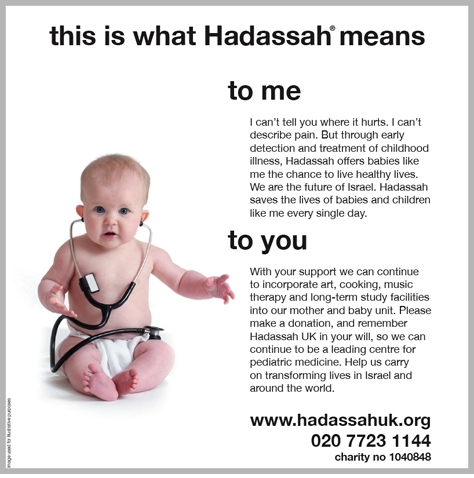 Hadassah wanted to increase donations from the UK, as well as to reassure past, present and future donors about their aims and achievements, and above all else to educate and inform the public. By positioning Hadassah as the largest and most important medical centre in Jerusalem, the aim was to establish it as a highly worthy cause for charitable support. The newspaper campaign, run over 6 months, was designed to create empathy, have longevity as a concept, and to make a specific connection between various target demographic groups and the beneficiaries of their potential donations.